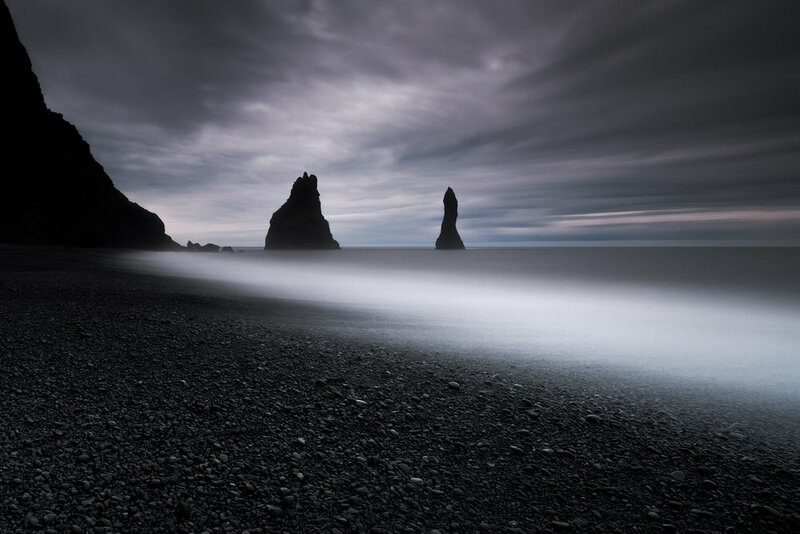 Iceland is just one of those places that all landscape photographers have to go. For such a small island, the diversity of landscapes is breathtaking. Waterfalls are everywhere caused by the run off from the huge glaciers in the centre, and then there are the incredible colourful rocks in the highlands and the stunning beauty of the Westfjords. It's also a country where one visit will never be enough, there's just too much to see there. You could quite happily spend a couple of weeks just driving around the ring road visiting the well known locations like Skogafoss, Vik, Godafoss and the Vestrahorn, but that would be to miss out on the other-worldly magnificence of the central highlands and the thousands of lesser know locations that are everywhere in Iceland. It's also a country of rapidly changing weather which can go from moody low cloud to sweeping light in a matter of minutes and where it's always possible to fit the tone of your photography with the mood of the light. It's an awe inspiring place, and I'm excited to be leading workshops and introducing this incredible county to other people starting in 2018. The waterfalls of Skogafoss in southern Iceland. The waterfalls at Godafoss in northern Iceland at sunset. A self portrait at the waterfalls at Godafoss in northern Iceland at midnight. 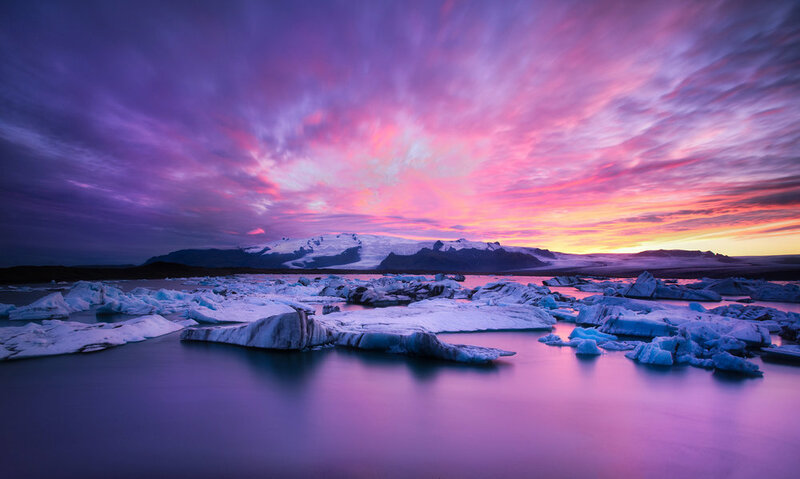 The colourful sunset we wished for never materialised, but so much of Iceland looks great beneath moody clouds. Another angle of the beautiful falls at Godafoss in northern Iceland just before the sun came up. The water at the falls of Bruarfoss runs so blue it looks as though someone has put coloured powder in it. Beneath midnight clouds it really is a beautiful sight. The water falls in multiple streams as this river is split on it’s passage across the plains of Iceland’s highlands before collecting again into this beautiful coloured river. Looking east at sunset in the Emstrur region of Iceland's highlands. From left to right the peaks and ridges are Tuddi, Útigönguhöftar, Stórkonufell, Litla-Mófell, Stóra-Mófell and the Botnar ridge. 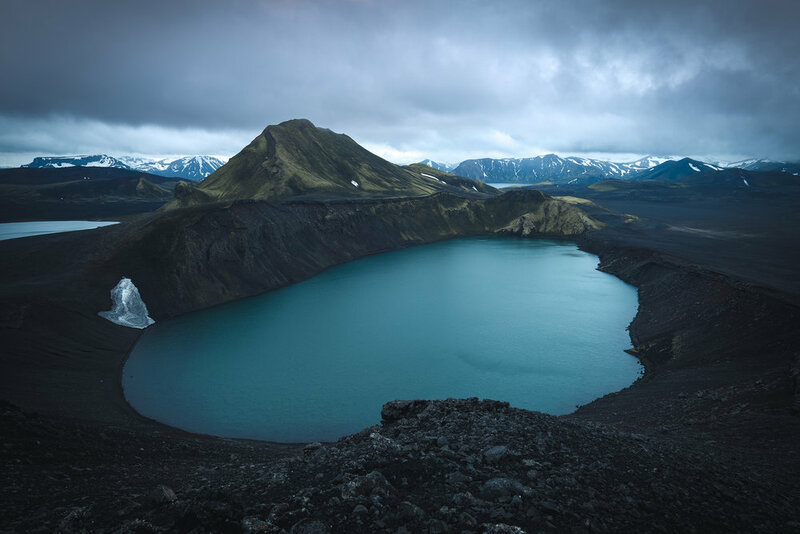 The incredible blue water of the Hnausapollur crater lake in the Iceland Higlands. I scrambled up here sometime before sunrise on the recent Iceland workshop to get an elevated view of this awesome place. Photos can’t really do justice to how big this lake is, nor how up were to shoot it. In summer in Iceland sunsets and sunrises blend into one another and on the evening I was shooting these peaks on on the south eastern corner of the country I had some of the most amazing light and colour I've ever experienced in Iceland. This is a 6 image stitched panorama of the black sand dunes and mountain range in this incredible place. The remains of a DC3 that crash landed on southern Iceland's Sólheimasandur beach. The incredible river braids of Iceland rivers get these colours and textures from the silt they pick up as they come down from the glaciers. It contrasts with the black river beds and the colourful moss and algae. I captured this image as we flew across the river deltas of the south of the country in a light aircraft. 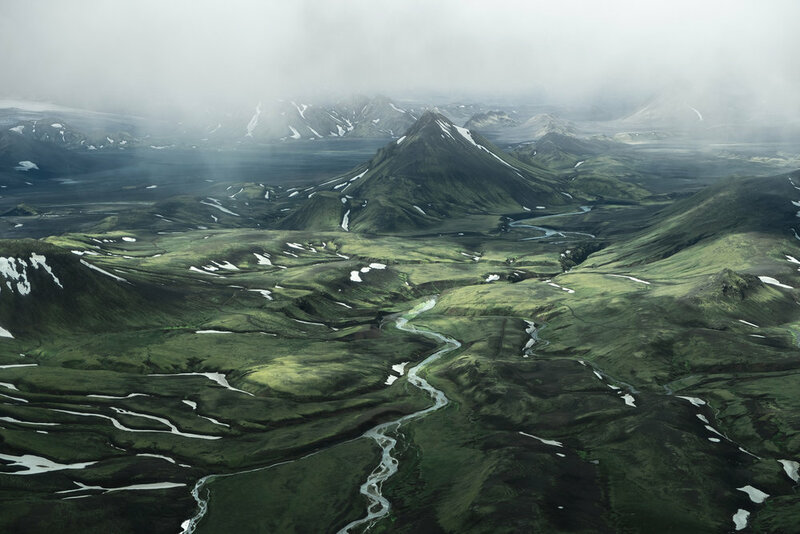 The braids of Iceland's Markaflojt river. The waters run down from the glaciers of Iceland's central highlands creating incredible patterns as they cross the black volcanic sands which can be seen from a low flying light aircraft. Another image of the river braid in Iceland taken from a low flying light aircraft. The peak of Stórasúla shot during an aerial flight above the highlands. The views from the plane were absolutely amazing, the patterns of green and black with patches of white snow. Iceland is an amazing country, and the views from the air above the highlands are some of the most stunning I've ever seen.